Whether due to Jimmy Butler’s influence or some other factor, Karl-Anthony Towns didn’t look quite like himself in the early goings this season. Whatever it was, it looks like he’s over it. 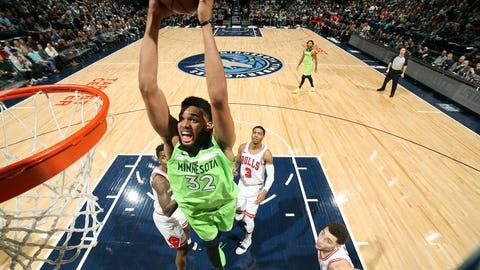 Towns went off Saturday in a 15-point win over former teammate Zach LaVine’s Bulls, dominating the paint to the tune of 35 points and a season-high 23 rebounds and tacking on six assists for good measure. It was a symbolic performance of sorts, a decisive victory over one of the biggest beneficiaries of the long and sometimes sordid Butler saga. Towns’ game was just the second 35/20 game so far this season. Nikola Jokic, himself a rising star in Denver, had 37 points and 21 rebounds two weeks prior. It was a particularly rare game by Wolves standards; There have been just six 35/20 games in Minnesota’s history, and Towns is responsible for three of them. His first, a 37/22 performance during a loss to Houston on Feb. 25, 2017, came almost six years to the day after Kevin Love’s only such game. Love, then 22, had 37/23 in a win over Golden State on Feb. 27, 2011. Al Jefferson, then 24, dropped 36/22 in a loss to Houston on Feb. 7, 2009. Unsurprisingly, a 26-year-old Kevin Garnett got there first, leading the Wolves to a win over Golden State with a 37/22 game on Feb. 16, 2003, amidst one of the best seasons of his 21-year career. On the surface, this looks like business as usual for Towns, who scored 30-plus points a dozen times last season en route to his first All-Star nod. Indeed, he had 39 points in the final game of the Butler era, an 11-point road loss to Sacramento. But Towns’ production has increased across the board in Butler’s absence. That’s squarely between his averages from 2016-17 — the best of his career, statistically — and 2017-18, his only season with Butler. It’s not a huge sample size, but if Towns’ resurgence continues, he could be in for a few more of these games in the months ahead.